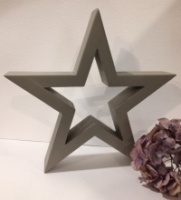 Stars are very much a signature these here at Hilly Horton Home and these gorgeous, wooden, decorative stars have been handcrafed locally to our exact specification. Our Artisan maker Dan, ensures that each creation is finished to the highest standard and these stars are offered natural or painted in a selection of colours and sizes. Small star measures approx 16.5cm at the widest point. 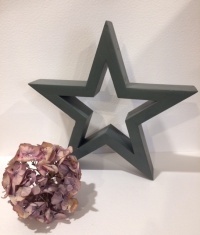 This star is painted in "Grey Oak" by Neptune.